A trend of deterioration in ore quality is seen these days with the increasing demand for iron ore. The deterioration in ore quality is accompanied with higher quantities of slag which in turn affects burden descent and liquid flow through the hearth. These conditions provide a catalyst for lining wear mechanism with bosh, stack and hearth linings coming under additional stress. Tapping in the blast furnace is adversely affected and trough and runners in the cast house get under strain due to higher slag volume. All these put increased pressure on blast furnace operations. The poor quality of iron ore affects the operation of the blast furnace in the following way. Slag volume – Poor quality of iron ores bring into the furnace higher quantities of impurities resulting into increase in the slag volumes. Heat load – The furnace thermal condition undergoes changes since a large quantity of heat is required to melt the additional slag as well as to keep it in proper fluid state for its drainage. This introduces higher heat loads inside the blast furnace. Coke rate and productivity – Increasing slag volumes needs a higher fuel input into the furnace, and where pulverized coal injection rates are already running at optimum, this results into a higher coke rate. Higher coke means introduction of higher amount of ash in the furnace resulting into further increase in the slag volume. This has got a deteriorating effect on the productivity of the furnace. Process stability – The deterioration in the ore quality affects the process stability adversely and has an unfavourable effect on the smooth running of the blast furnace. Due to the above factors, the production process in the blast furnace varies widely. The wide variation in the process has consequences in terms of slag composition and therefore hot metal quality. The above factors also affect the process in many other areas as given below. Higher slag volumes have influence on the gas flow. With higher slag volumes, liquid flow through the hearth is more challenging, leading to increases in fluctuating liquid levels in the hearth. In the extreme case, burden descent gets affected. The increased incidents of compromised gas flow due to the poor quality of ore are likely to appear as increased hanging with more frequent and severe slips. This in turn acts as a catalyst for greater lining wear, with bosh, stack and hearth linings coming under more stress. Higher slag rates provide a large constraint in the cast house since the furnace trough and runner system in the cast house become a bottle neck in accommodating the higher slag volumes. To accommodate the above and many other scenarios which can be expected during the blast furnace operation, a number of actions are needed to have adequate control during blast furnace tapping, to prevent the furnace running either cold or hot, and for smooth operation of the blast furnace. These actions include (i) hearth management for optimum drainage and minimum wear to counter the higher slag volumes, (ii) adapting process and burdening strategies for optimum stability and minimized heat loads on the furnace wall, (iii) close monitoring and proper maintenance of the blast furnace cooling system so that it can absorb the higher heat loads, and (iv) assessment and de-bottlenecking of the existing cast house layouts for the increased liquid flows. The hearth, dead man and the flow of hot metal and slag towards taphole during furnace tapping can be seen in Fig 1. The state of the hearth plays the most important role for stable furnace operation and long campaign life. This lowest region in the blast furnace is exposed to liquid iron (hot metal) and liquid slag which are in direct contact with the refractory materials, causing severe erosion and chemical and thermal attack of the hearth lining. The most aggressive environment in a furnace hearth is usually found in the vicinity of the taphole(s), which is subject to high thermal stresses and liquid flow velocities. The taphole management (integrated with other operational guidance techniques) is crucial in hearth performance and, hence, in the overall furnace operation. The hearth is the lowest, but the most important part of the blast furnace. The campaign life of the furnace considerably depends on its hearth durability. The hearth sidewall and bottom are usually built with carbon based blocks or bricks combined with high quality ceramics. In principle there are two basic hearth designs. The first one is the small block or brick design while the second one is the large block design. The design difference is due to the size of the refractories. The main advantage of a small block hearth is ease of construction, as the bricks can be manhandled into position and mortared on all sides. Another advantage is that the bricks are less prone to cracking as the hearth as a whole is basically already cracked. This, however, is also a disadvantage as each joint can serve as a heat transfer barrier, especially if there is movement and the joints become gaps. The big blocks do not suffer the same disadvantage as there are much fewer joints. However due to thermal expansion, the large blocks tend to crack, thus causing similar heat transfer barriers. Within the two basic designs there are several variations, and some similarities between the big and small block designs. These similarities and differences are the type of refractory material being used against the wall, the hot face, and around the tapholes. One of the biggest considerations is the transfer of heat from the interior of the furnace to the cooling medium. For this, various types of refractories are normally used. In general, the cost increases with the thermal conductivity. Although it would be very costly, the best hearth is in theory built with the highest conductivity refractories. Such a hearth would last forever and never wear (due to a freeze lining protecting the refractories), but it would also take so much heat from the furnace that the cost of operations would be high. Such a hearth would cool so rapidly during a furnace shutdown that it would be difficult to start up again, leading to even higher costs. Usually in the designs of the hearth, a balance is kept between the factors mentioned above. The hearth linings are equipped with a number of thermocouples and cooling elements. The dead man is situated beneath the active coke zone and (mostly) below the raceways. The upper part of the dead man is cone-shaped with a rounded top in the region between the raceways. The inclination from the dead-man apex to the raceways is about the same as the repose angle of the charged coke. The hearth is mainly occupied by a coke bed, which is a part of the dead man extending from the tuyere level. Liquid iron and slag dripping from the cohesive zone accumulate in the empty spaces of the dead man. As a result of gravity, the liquids segregate into two different layers with the heavier iron in the bottom and the lighter slag on the top. As both iron and slag continuously drip down from the cohesive zone, the iron droplets are to sink through the slag layer to the bottom. The top layer therefore consists of a mix of slag and iron droplets. The porosity of the dead man is between 0.3 and 0.5, which indicates that only 30 % to 50 % of the total volume is available for the liquids if the dead man fully fills the hearth. In fact, the dead man may either sit on the bottom of the hearth, or floats partly or completely in the liquid bath if the buoyancy force of the liquids is sufficient to lift the dead man. A partly floating dead man sits on the central hearth bottom and gives rise to an annular coke free zone at the hearth edges, which offers little flow resistance when the hearth is drained. Therefore, a circumferential flow is formed, being the main reason for the ‘elephant foot’ shaped wear in the hearth. 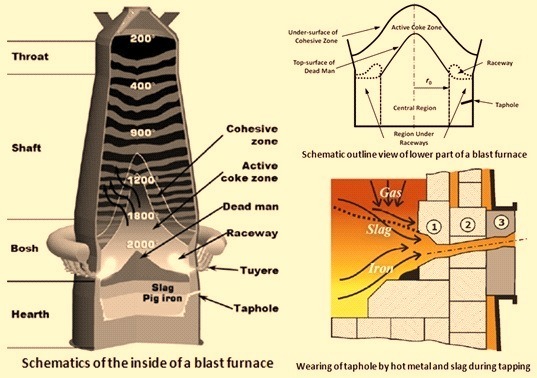 The dissection studies of quenched blast furnaces have shown that there is an almost stagnant coke bed in the core of the furnace between raceways and in the hearth. The stagnant zone, where coke descends with a strongly reduced velocity, has been given the name ‘dead man’ since it was earlier presumed that this zone has no active effect on the functioning of the process. However, this assumption has later been proven incorrect as more relevant studies revealed that the dead man plays a key role in the blast furnace operation. The studies related to the deadman are usually carried out by using physical and/or mathematical models since the dead man state cannot be directly measured in an operating furnace due to high temperatures, wear, and extremely hostile environment for measuring probes. The upper part of the dead man is cone-shaped with a rounded top in the region between raceways and it can extend from hearth bottom to far above the tuyeres level. The height of the dead man is dependent on the furnace size and the operating conditions such as coke rate, blast velocity, burden descending and dead man renewal rate. The solid mass/volume losses due to iron ore (reduction) shrinkage and meltdown strongly affect the solid flow pattern and hence also the profile of the dead man. It has also been found that the dead man height decreases as the solid consumption rate increases. The upper boundary of the dead man has been the subject of many investigations both theoretically and experimentally. These investigations have shown that the dead man is surrounded by a quasi-stagnant zone where the charged particles eventually move to the raceway. The dead man size is sensitive to whether the furnace operation is carried out with or without ‘pulverized coal injection’. The investigations have also shown that the dead man is renewed from a small central inflow region at the top of the dead man. Therefore, good dead man permeability can be maintained by charging large, high quality coke in the centre of the blast furnace. It has also been found that the cyclical accumulation and removal of liquids in the hearth due to the tapping operation is closely related to the dead man renewal process. The dead man particles move gradually into the raceway as the tapping operation is repeated. The renewal of particles occurs in such a way that the ‘old’ particles are forced to go out of the dead man by the buoyancy force (exerted on the submerged part of the dead man) and the ‘new’ particles come in to fill the dead man through its top surface. The dead man state and bottom shape have strong influence on the wear of hearth linings and liquid drainage from blast furnace hearth. The dead man is submerged in a large liquid bath and is subject to liquid buoyancy exerting on it. As the liquid buoyancy becomes sufficient to lift the dead man, coke free zones are formed beneath the dead man, hence creating a free passage for liquid flows. The dead man has a dynamic behaviour as it moves with varying liquid level. It has been found that the movement of the dead man is affected by hysteresis as it ascends and descends in the hearth. The shape of dead man is determined by several factors. It can be estimated by a balance between the force pressing down the dead man and the buoyancy forces of iron and slag in the hearth. The buoyancy force is relatively straightforwardly estimated as it is a function of liquid level and dead man porosity. However, the downward acting force, which is usually expressed in the form of a pressure, depends on the furnace conditions, such as burden weight, raceway length, liquid holdup and gas drag. The burden weight above the tuyere level is compensated by the lifting pressure of upward flowing gas and the downward acting pressure under the raceways (i.e., region under raceways) is thus only attributed to the dead man weight. On the other hand, the downward acting pressure on the central region is formulated as a function of dead man weight, liquid holdup and dynamic pressure of particle flow. The dynamic pressure, which is caused by the particle converging flow within the active coke zone is assumed to decrease linearly along the radial dimension from the furnace centre to the raceway front. It is usually seen that the dead man floats higher beneath the raceways. The distribution of the downward acting pressure plays a crucial role in shaping the dead man bottom. Some studies have classified the dead man floating state into four categories namely (i) sitting, (ii) partly floating at the wall, (iii) completely floating with a flat bottom, and (iv) completely floating, but floating higher near the wall. Tapping a blast furnace is necessary not only to deliver the blast furnace products, but also essential to the safety of the furnace and the operators in the cast house. The tapping of blast furnace, also referred to sometimes as casting or drainage, is a process that removes hot metal and liquid slag from the blast furnace hearth. Present day technology of blast furnace tapping employs full pool practice. This practice refers to the technology of keeping the trough filled with hot metal and liquid slag during short periods when the furnace is not being tapped. During the following tap, the trough is still liquid, making it easier to separate iron and slag, as well as preserving heat in the trough, resulting in cleaner, hotter iron delivered to the steel melting shop via rail transport in refractory lined open top or torpedo ladles. The tapping process critically determines the in-furnace gas pressure and residual amounts of liquid iron and slag in the hearth. Poor hearth drainage usually leads to unstable furnace operation which is generally connected to marked losses in furnace productivity and campaign life. An inefficient drainage also gives rise to excessive accumulation of liquids and thus high liquid levels in the hearth. If the liquid (slag) approaches the tuyeres level, the reducing gas flow in the bosh is severely disturbed, often resulting in irregular burden descent known as hanging and slipping. A tapping cycle begins as the tap hole is drilled open and is terminated by plugging the taphole with the taphole mass when the furnace gas bursts out. At the end of the tapping, the gas-slag interface tilts down towards the taphole and a considerable amount of slag remains above the taphole level. The iron phase can be drained from levels below the taphole because of the large pressure gradient that develops near the taphole in the viscous slag phase. The average slag-iron interface is therefore lower than the taphole level. Depending on a number of factors, such as liquid production rates, hearth volume and tapping strategies, the initial stage of a tapping cycle varies and can be categorized as follows. Iron first -This occurs if the slag-iron interface is above the taphole level when the taphole is drilled open. The tapping cycle starts with an outflow of iron only, and slag starts flowing later when the slag-iron interface has descended to the taphole. After this, iron and slag are drained simultaneously until the end of the tapping. The time elapsed from the start of the tapping until slag enters the runner is called the slag delay. Simultaneous – This pattern appears if the slag-iron interface lies in, or at a finite depth below the taphole when the tapping commences. The high pressure gradient in the slag phase can promote iron flow, or even drags iron up from below the taphole. As a result, iron and slag are drained together during the whole period of tapping. Slag first- This is opposite to the iron first pattern. In this pattern slag flows out initially and iron after a delay. This is because the slag-iron interface is far below the taphole as the tapping begins, and the phenomena can be observed in larger furnaces with multiple tapholes. The pressure gradient caused by the viscous slag is initially inadequate to lift iron up. A primary requirement of tapping is to secure reliably the desired rate of furnace products. Thus, establishing the factors influencing tapping rate are important. Normally in the large blast furnaces, tapping rates of 7 ton/min, and liquid tapping velocities of 5 m/sec, in tapholes of 70 mm diameter and 3.5 m long are typically encountered. Taphole condition and taphole length strongly influence the tapping rate. When the blast furnace is in operation, the taphole is completely filled with a refractory material known as the taphole mass. Important factors which often cause difficulty during tapping operation are (i) defects in taphole guns and drills, or faulty alignment of these to the taphole, (ii) poor condition of taphole, tapping spout, skimmer, gates and tilting, swinging or other runners, (iii) inadequate capacity of the ladles for transporting hot metal, and (iv) trouble in the system for the granulation of slag as well inadequate space in the slag pit. The tapping schedule depends on the quantity of liquid iron and slag, hearth size, the rate of tapping and the preparatory operations required between each tapping operation. Immediately before tapping usually the taphole, the correct functioning, position and alignment of taphole guns and drills are to be checked to make sure that they are correctly aligned to the taphole (if necessary, their positions may be corrected). The advantage of this practice is that it allows a final check to be made for defects or adjustments not yet noted and makes it possible to remedy them. The taphole is opened using drills of certain sizes, depending on the operating conditions, and in some cases the last part of the plug is staved in. If the drill hole is not long enough, the taphole has to be opened up by an oxygen lance, taking all the precautions required for the use of oxygen. Tapping may be disturbed if the jet of hot metal flows into wet runners, as this may cause boiling in the runners, accompanied by explosions. It is therefore essential to carry out minute checks and to dry the troughs and runners thoroughly, as boiling in runners often reaches such proportions that the tapping operation has to be interrupted. This is one of the reasons why the escape exits are to be kept free at all times. Stopping tapping while it is under way is an operation calling for maximum power from the taphole gun (as plugging has to counteract the full force of the flow of molten metal). In some cases it is necessary to reduce the blast and top pressure enough to allow the taphole to be plugged. Rapid improvised repairs are carried out on the damaged parts of the runners, using dry material. If the taphole gun is moved away from the taphole too soon, there is a danger that the plugging clay injected into the taphole may be suddenly expelled with an explosion, as the material may not have had time to solidify. Because of this, cast house operators must stay outside the ‘line of fire’, in case such outbursts occur. The flow of slag which precedes the hot metal at the beginning of tapping can also cause disturbances. In this case the cast house operator is required to make adjustments in the immediate area of the taphole and the runner, to direct the slag towards the runners intended to carry it. This is one of the reasons why there is to be a free space available in front of the taphole on either side of the iron runner, and this space is to be as large as possible. The main job of the cast house operator, during normal tapping operations, is to see that the flow of hot metal and liquid slag into transport ladles or adjoining installations is smooth and without incident. The size and incline of runners are to be related to the other technical features of the blast furnace. However, there is a possibility of hot metal and/or slag stagnating and overflowing, and this call for immediate action by the cast house operator. Tools used in this operation are to be completely dry; otherwise the water can vaporize suddenly, leading to an explosion. It is also important to check the condition of discharge openings into ladles very carefully, as solid matter may be carried along by the flow of hot metal and may block gates which have a relatively small cross-section. The taphole can be obstructed (e.g. by coke) during tapping. The taphole drill is normally used to dislodge such obstructions, but if this fails, long rods (rabbles) are used. This operation is dangerous because of the possibility of sudden outbursts of hot metal and slag. It is therefore essential for the cast house operators to have immediate access to an emergency exit free of any obstacles. The greatest care is to be taken in construction of slag runners. They are to be fitted with gates capable of holding back the hot metal and coke carried along with the slag to minimize the danger of explosions during slag granulation. One of the most important jobs of the cast house operators engaged in the tapping operation is to supervise the filling of hot metal ladles, making sure that this does not exceed a level where the contents might possibly spill out during transport, or overflow during filling. As the ladles are usually filled one after the other, the operator must be able to direct the flow of hot metal into the appropriate channels. Tilting and swinging runners and spouts also have the advantage of minimizing the risk of moisture in the refractory lining, which is much greater with conventional gates, as the lining is renewed after each tapping operation. Towards the end of tapping, the flow of hot metal becomes irregular and is accompanied by a strong blast of air and as the hearth empties, these phenomena become more frequent. At the same time, hot metal and slag spatter out and may finally cover the whole area of the cast house. To avoid this, the taphole must be plugged as soon as possible. The operator moves the taphole gun up to the taphole and plugs the hole by injecting the correct quantity of plugging clay.